Inner City Press asked Bamba about the one month delay in reporting by the African Union's High Level Panel. Bamba called it outrageous, saying that eight women had been shot that morning in Abobo by Laurent Gbagbo forces using heavy machine guns. Inside the Council consultations room, Inner City Press is told, the UN Department of Peacekeeping Operations stopped short of confirming these deaths. DPKO is running scared, from having had to say it made a mistake in reporting that Gbagbo was importing attack helicopters from Belarus. On that report, Bamba insisted that the basic idea is true. 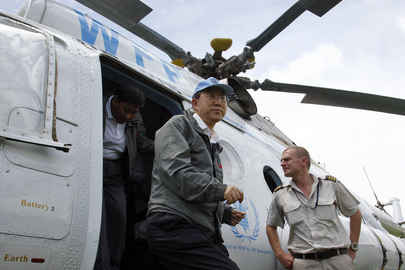 At Thursday's UN noon briefing, Inner City Press asked Secretary General Ban Ki-moon's spokesman Martin Nesirky, in light of the admission of mistake by DPKO's Alain Le Roy, who is part of and leading the investigation, reporting to whom and when, and if it will be public. Nesirky said he'd check, but five hours later there were no answers. Afterward, a Council delegation not as supportive of Ouattara as most other Council members are told Inner City Press that Bamba should be quizzed about the anti-Gbagbo Forces Nouvelles also preparing for battle, asking why Ouattara, if he wants to be a president for all, doesn't denounce that too. Bamba again used the word “genocide.” Inner City Press asked him if he had in fact met with International Criminal Court prosecutor Luis Moreno Ocampo. 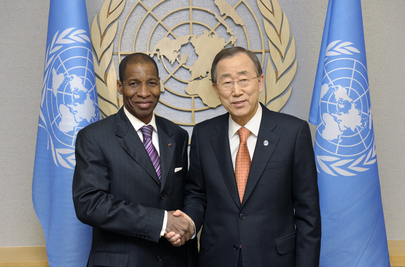 Bamba replied that two Ouattara ministers in Geneva will raise it to Ocampo. In Geneva? Watch this site. Footnote: Bamba had left he UN when the Cote d'Ivoire press statement was read out, already headed to Boston to give a talk. He came back to rebut it, long after most reporters had left. And so it goes at the UN.